It’s predicted that over 70% of marketers plan to create more content in 2017 than they did in 2016, and over 75% will invest more in their content marketing programs. That’s a lot of content, across a growing number of channels. So how can marketers differentiate and compete? The answer is simple, personalise then conquer. As the demand for quality content reaches its highest peak, the measure should not be how much content you publish, but how valuable that content is to your audience. The objective must be to stay relevant to customers at every touch point, anticipating and accommodating their needs from start to finish throughout their customer journey. Hubspot does this remarkably well. From the how-to articles down to case studies and relevant marketing insights, Hubspot’s content is relevant, full of actionable tips, and utility. From here, you can start to tailor content towards these questions for each persona. Different sets of questions will arise as the persona goes through different touch-points and stages of the funnel. Salesforce do this very well. Rather than just focusing on the content they deliver, they focus on the type of content relevant to their customers across the sales funnel. From market insights (Awareness) and valuable how-to articles and customer stories (Interest & Consideration), to trial offers (Action), and articles to help improve user efforts using their platform (Retention). Improve your content by continuously revising it based on customer feedback. Analyse your data, test your content, learn what’s working, and what’s not. This constant review loop is what will help you develop strategic content that cuts through and resonates. 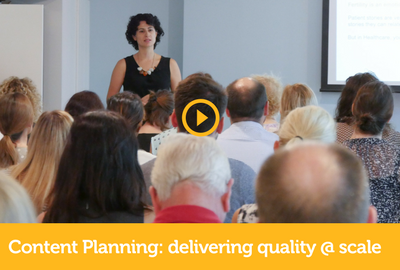 To find out more, listen to our Content Planning presentation.